St. Louis Food Blogs: Saying Goodbye to Nupur from "One Hot Stove"
Saying Goodbye to Nupur from "One Hot Stove"
Food blogs come and food blogs go. Some bloggers lose interest, their blogs wait patiently for the next post -- but it never comes. Some bloggers post a last one or two excuses, "I'm so sorry I haven't posted in so long, I promise to post more" -- but they don't. Others make a big announcement, "Copy what recipes you want, the site comes down in thirty days," I've seen. 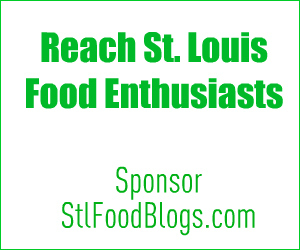 In this case, one of the very first St. Louis food bloggers is leaving our city. Nupur Kittur from the food blog One Hot Stove was one of my very first blogging friends, back in the days when even our worldwide food blog community was so small, most food bloggers knew one another, at least by blog name. When she and her husband Vasant moved from New York to St. Louis in 2006, it was such a pleasure to move our friendship into the real world. Now Nupur and Vasant and Baby Lila are heading south to Athens, Georgia where the two scientists have taken on new posts at the University of Georgia. At lunch last week, Nupur relayed for me the many things she will miss about our city, one is our small community of local food bloggers. So stop by One Hot Stove to wish Nupur good luck as she and her family move on. Oh Alanna, thank you so much- for your warm welcome 6 years ago, your unique talent for building the St. Louis food blogging community and now for this sweet goodbye. I'm leaving the city but hope to be part of your circle of friends for all time.